Product #21991 | SKU TS32GCF800 | 0.0 (no ratings yet) Thanks for your rating! 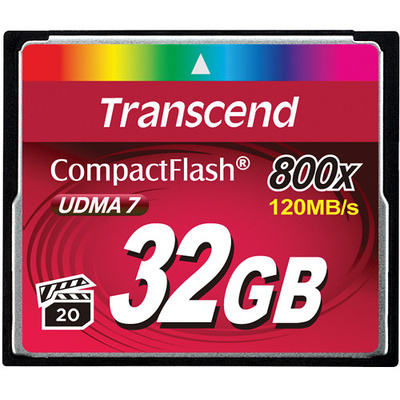 The 32GB 800x CompactFlash Memory Card UDMA from Transcend features a 32GB storage capacity perfect for storing those HD photos and recording HD video. The enhanced 800x speed rating and ultra fast 120 MB/s data read and 60 MB/s data write speeds are backed up by an MLC Flash chip ensuring enhanced performance and durability. In addition to the enhanced data speeds and storage capacity, this CompactFlash card also helps to maximise your battery runtime as it supports reduced power consumption. Note data read/write speeds based on Transcend testing. Actual transfer speeds may vary due to host hardware, software, and usage.